The E36 M3 as well as the 3-series boasts an unmistakable presence on and off the road in things such as car shows, BMW Car Club events, and at almost all track events throughout the United States, Canada and Europe. Turner Motorsport formed its identity as a successful BMW race team and tuner around the E36's performance and styling on and off the track. It has also served as a means to sustain Turner's success, expertise and engineering from the racetrack to the street. When the E36 M3 was first put into production, it was the fastest and most powerful M3 yet. The car was outfitted with a 3.0 L straight-6 producing 240 HP and 224 ft/lbs of torque. The second generation came with a 3.2 L straight-6 producing the same 240 HP but with an increased torque of 236 ft/lbs a 3,800 rpm. Although these engine specs are almost two decades old, the E36 is still a substantial driving force on market demand for OEM, Performance and race parts. Although the E36 M3 is an incredibly capable car out of the box, there is always room to improve, especially when all new BMWs come standard with over 200 horsepower from the factory. To keep up with the times and BMW's latest power plants it only made sense to give the 1999 M3 an injection of power and performance to update it to today's standards. This is why Turner Motorsport offers such a complete collection these parts for the E36 M3 and 3-series. TMS carries a wide variety of parts for these cars from OEM radiators to complete coil over suspension systems to supercharger kits. To help demonstrate what we mean, we have chosen an E36 driven on the street as well as the track that has had many hours in our shop fitted with many of our products. Our project E36 M3 has been fitted with an extensive list of products that Turner offers. A complete list can be found below. The Active Autowerke Stage 2 Kit is a perfect match to the E36 M3. It boosts the power from 240hp all the way up to around 400hp and even higher with other modifications such as M50 manifold, TMS Shorty Headers, Shrick Cams and Catless Track pipe. When running on 91-93 octane the Active Autowerke Stage 2 Kit is the perfect balance of thrill worthy performance while still retaining that BMW feel for a comfortable daily commute. One of the biggest selling points on this kit is the everyday drive ability and "stock" feel that the car retains. When driving at normal cruising RPM between 1500 and 4000 the car feels much like it did before the supercharger despite the added low to mid range torque. The power gains are simply awesome. The car makes a ton more power from 4000 to redline. The power curve is extremely linear and there is not real surge or drop off of power anywhere in the RPM range. It pulls hard all the way up to 7000 RPM and it feels awesome! This added power combined with the 3.46 ring and pinion in the differential make the car extremely fast from a stand still as well as moving and on the highway. The 3.46 is a perfect gear for this setup, allowing the car to be in the power almost all the time while still maintaining somewhat of the stock feel (compared to a 3.64). Overall the kit is a great fit for the car. The tuning is seamless, the install is clean and the drive ability is superb. If you are looking to make over 300 whp in an E36 M3 or Non M this is the way to go and combined with the correct bolt-ons its easy to make even more power relatively easy. All the performance and maintenance items installed on this car all have one common goal in mind. Practicality, Reliability, and Function. Each Performance upgrade on this car is done with these three things in mind. This car has a dual purpose; Track and Street. We wanted the car to be a comfortable daily driver with extreme high performance that was both dependable and usable on the track. Too many times performance upgrades are done with only one thing in mind and that is where the car starts to drift away from a everyday driver. We feel that all the Performance upgrades made to this car are extremely dependable for everyday driving and provide a great value whether it is improved handling, better pedal feel, increased throttle response or simply making horsepower, each of these products have been hand picked with our goal in mind. We would recommend these products to anyone who is looking to take their E36's performance into the current day, while still maintaining those characteristics that make the E36 M3 so unique and desirable to many BMW enthusiasts. We cover everything from suspension mounts, bushings and braces to engine software and exhaust. Take a look at what we have done on our own E36 M3 street and track car and take your E36 to the next level. View the blog here. Forgeline's new Heritage Series line of forged wheels are designed to represent the best of Forgeline's over two decades of engineering and manufacturing custom, made-to-order forged aluminum wheels. These classic designs are retro-cool and work well with virtually every class of automobile, from muscle cars to supercars to luxury vehicles. The Forgeline LS3 Heritage Series wheel on our Turner Project Supercharged E36 M3 evoke classic and timeless styling, perfectly suited for the E36 M3's modern-classic status. The Forgeline LS3 Heritage Series wheel pays homage to Forgeline's very first wheel designs, the classic LS of the 1990s, but has been reborn here as a modern 3-piece wheel with updated engineering and manufacturing technology. A tight mesh design with very intricate machining details, the LS3 is elegant and timeless. The LS3 is built with true forged 6061-T6 aluminum centers, aircraft-quality ARP stainless steel fasteners (your choice of exposed or hidden), and heat-treated rim sections. 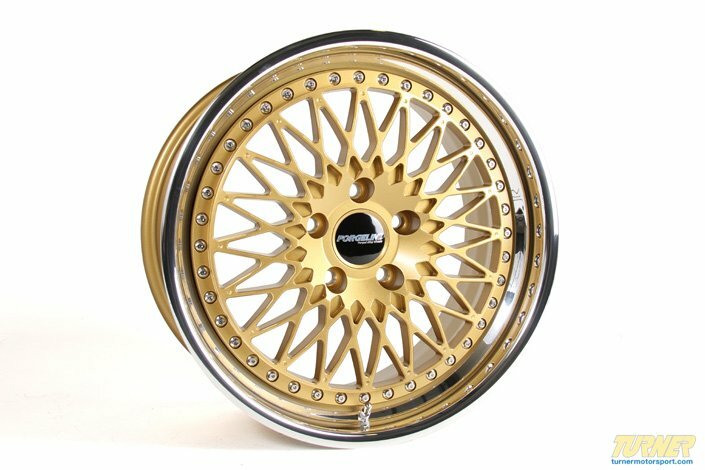 The LS3 is available with a stepped lip outer in 17-inch, 18-inch, and 19-inch fitments and features a standard powder coated center finish with a polished outer rim. But since each wheel is custom built-to-order, Forgeline can also offer special features like custom offsets, center locking hubs, and a large choice of finish combinations. 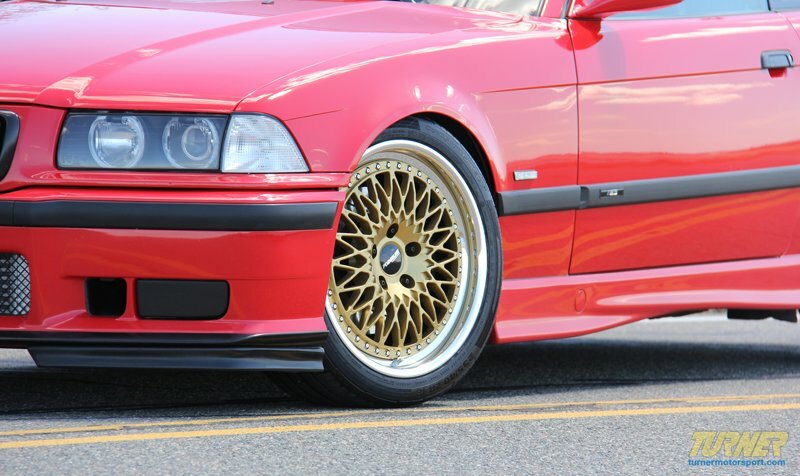 Our M3's wheels measure 18x8.0" in the front and 18x9.0" in the rear. They are finished in Satin Gold with a highly polished lip. Each wheels, both front and rear weigh-in at 24lbs. Forgeline's LS3 wheels are truly stunning, especially when combined with equally timeless and classic Hellrot paint on our E36 M3. For tires we chose to go with the Continental Tire ContiSportContact 5P which is Continental's latest super high performance street tire. The tire has been chosen as a OE tire by several German auto manufacturers including BMW on the new M3 and M4. The 5P is available in widths from 225 all the way up to 325 and fits diameters from 18 to 23". We chose to go with the 235/40/18 and 255/35/18 for the Project E36. Bilstein's celebrated PSS9 coil over kit for the E36 M3 combines height adjustment struts with Bilstein's 9-position monotube shock absorbers. The PSS9 coilovers offer a stiffer spring rate than stock and a lower ride height for less bodyroll and better handling. These are among the easiest coil over kits on the market - no special mounts required (works with stock mounts and sway bar links), larger adjustment knob allows for easy shock damping changes, and coil over spanner wrenches included for easy height changes. Bilstein backs up their technology with a limited lifetime warranty. TUV approved for fitment, safety, and quality! This is the 3rd Generation of the TMS E36 sway bar / swaybars and features CNC'd ends for greater precisicion handling, re-countoured bends for better clearance, an even larger 30mm front bar and a 24mm rear bar, both with 2 holes for adjustment. This is one of the largest diameter solid front bars available, perfect for taming that understeer. You get the best of both worlds with the TMS adjustable sway bar / swaybar links. You get the same quiet operation and long life as the stock links plus the strength and adjustability of rod-end style sway bar links. With the wide range of suspensions and sway bars available today adjustable sway bar links can help you with many problems. These links are perfect for the E36 M3, especially when using coilovers and larger diameter sway bars. The custom-made TMS adjustable camber plates for the E36 provide up to 4 degrees of negative camber (caster is not adjustable). These beautifully made aluminum camber plates have solid no-play spherical bearings that are ideal for racing or high performance track events. These camber plates are nearly identical to the BMW Motorsport version with a few TMS improvements (including the price). These units replace the rubber upper strut bearing and are easily adjusted by loosening the 3 factory nuts and sliding the camber plate in and out. Because of the clearances between the spring and the body of the car these are suggested for use with coil-over front struts only, using a 60mm, 2.25" or 2.5" ID race spring. The Turner rear trailing-arm bushing limiter kit creates a stiffer rear suspension without sacrificing ride quality. Stock trailing arm bushings are known for failure, on both the E36 and E46 BMW chassis. Recommended for EVERY E36 Owner! The Original BMW chassis reinforcement developed for the special M3 LTW (Lightweight) model. This tubular-steel part connects the front subframe to the body and gives the car a more solid feel with less flex. Every convertible and Roadster model uses a similar design to address inherent chassis flex in the front of the car. Fits all E36 and Z3 chassis BMWs. 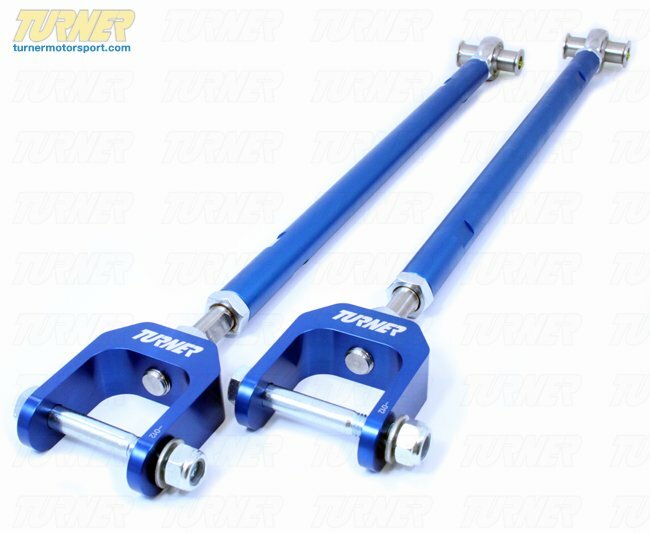 Turner Motorsport developed these in association with our European partners to provide a higher quality and better performing strut brace than our competitors. Made of aircraft grade aluminum these strut braces - also know as a "stressbar" - help to minimize chassis flex during the hardest cornering, which keeps your tires squarely on the road and delivers the traction you need when you need it most. 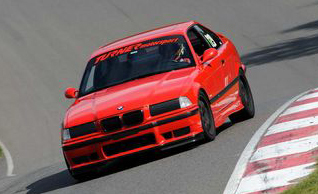 Let's face it, the E36 is an old chassis but it's still the most popular car to build for track-use. But because of it's age, certain parts of the chassis are prone to structural failure. We've been racing the E36 for over ten years so we know what the weak points are and how to make them stronger. Stoptech ® Stainless Steel Braided Brake Lines provide a quicker, firmer, more consistent pedal response by maintaining consistent brake pressure. Additionally, stainless steel lines provide precision brake modulation, especially during threshold braking. The improvement in pedal feel is more dramatic on older vehicles where the factory rubber line may have softened and swelled due to age. Slotting a rotor helps to release gases that build up between the rotor surface and an out-gassing brake pad. Without an escape, this thin layer of gas will cause a delay until the pad cuts through gas layer. The slots in our rotors allow the gases to escape giving better braking performance. For track and racing use, slotting is preferred over cross-drilling because the slots don't take away as much mass from the rotor and won't suffer from structural cracks. Upgrading or rebuilding the differential is one of the keys to performance on your E36 325i/328i or E36 M3. Adding a shorter gear set will make the car accelerate quicker with almost no downside. And adding or changing the limited slip unit will improve traction and handling. The diff is crucial to getting the most out of popular engine upgrades such as an M50 manifold swap and cams where the new gear ratio will keep you in the power band sooner. New EVO 3 edition! UUC's latest update has resulted in even smoother shifts, a reduction in vibration, and more features! UUC redesigned all of the pivot points in the shift linkage and shift lever itself to reduce notchiness. The result is a shifter that is 35% shorter than stock but closely matches the factory feel. Save 15 lbs! Aluminum flywheels are much lighter than the stock steel flywheel and that produces better throttle response and more available horsepower to the wheels for faster acceleration. The JB Racing aluminum flywheels are a direct replacement for the stock flywheel and work with stock clutch components for an easy upgrade with very little downside. In addition to releasing more power to the wheels, the lighter flywheel allows the engine to spin more freely, which improves throttle response. The SPEC Stage 2 clutch is a premium, no compromises heavy-duty clutch upgrade for the 1996-1999 E36 M3. Where the stock clutch is well-known for premature wear when driven hard and the factory dual mass flywheel is a known failure point, the SPEC clutch delivers with an over-engineered, performance-oriented clutch solution. The single carbon-Kevlar clutch is rated at 370 ft-lbs, more than enough for the naturally-aspirated S52 engines. A heavy-duty pressure plate and throw-out bearing complete the package. Turner Motorsport vinyl graphics are made from high performance cast graphic film, which has superior resistance to sunlight and adhesive longevity. The Turner Motorsport Logo is printed in super high quality vinyl inks giving the banner a professional look. We currently offer the Turner Motorsport logo in either white or silver, with gloss black trim on a matte black background. Just like the ones on our Turner Motorsport Project Cars! These direct replacement center grills let you eliminate the stock chrome kidney/center grills, feature perfect fit and beautiful finish, and give a darker more aggressive look to your 1997-1999 3 series (including M3). Kit includes two blacked out grills with matte black finish. Kit includes front turn signals, rear tail lights and optional side markers. These European clear turn signal lights make a huge improvement in the aesthetics of the BMW E36. They are very easy to install with simple hand tools. We have packaged the whole car as a set with discount that saves you money. No one buys an M3 because they like limits. This carefully engineered kit matches the Rotrex C38 supercharger with the perfect hardware, software and tuning to take the factory 240 HP straight up to 360 HP (with the potential for even more power with additional upgrades). Best of all, if your craving for more power is still insatiable, there is a higher upgrade Level 2 featuring more boost and a front mounted air to air intercooler. The Active Autowerke supercharger systrem is truly modular and fully upgradeable. It takes the guesswork out of adding the M50 manifold to your engine. The kit includes a CNC machined adapter, with all hardware and gaskets, that allows the freer flowing M50 manifold to be installed while maintaining full function of M52/S52 components including factory PCV cyclone / oil seperator valve. No vacuum leaks, no check engine lights. This software is a major refinement of the stock software. It makes the car much easier to drive with less hesitation, more torque, and incredibly smooth operation. A lot of tuning has been done at the middle RPM ranges to improve response. The car won t hesitate or lag, making the car easier to drive. And with the extra torque you can drive in a higher gear and not have to downshift as often. Underdrive Power Pulleys work to 'free up' horsepower. Any accessory that spins from the main drive belt is using up power. That's power that could otherwise be used to move the car. By giving some of that power back to the engine, you can make the car faster! It's like FREE HORSEPOWER! We measured 10.7 whp at 6960 rpm and 8.1 lb-ft of torque at 5550 on a 1995 M3. Turner Motorsport developed part, our "shorty style" performance Headers are 100% stainless steel, are 2-stage ceramic coated and were CAD designed to be equal length and flow with equal pressure. These headers were designed to increase mid range power. Bolt these on to your stock E36 M3/325/328 or Z3/MZ3 for a instant increase of 12 ft-lb torque and a 9 HP... more on modified engines! This track/racing center exhaust for the E36 325 and E36 M3 replaces the heavy and restrictive stock catalytic converters. On a 1995 M3 this exhaust alone showed gains of almost 20 HP and 15hp on the 1996-1999 M3! It bolts to the stock exhaust manifold or the TMS Shorty Headers without cutting or fabrication. This part alters or deletes the emissions equipment on your car. Because of this, we require a waiver of emissions compliance to be signed and sent in to TMS. Decreasing the restrictive back-pressure results in more horse power and torque, as well as the inspired sound this system creates for your E36's inline 6 cylinder engine. This is a complete cat-back system, which bolts to the factory catalytic converter and replaces everything rear of the cat on your E36 M3/328/325. Made 100% in the USA in Corsa's Ohio facility, this exhaust features a lifetime warranty from the manufacturer. These latest generation of the Turner Motorsport Wheel Spacers represent a total redesign of the wheel spacer concept . This is not just a rework of an existing spacer but a ground-up, clean sheet design based on our years of BMW service and motorsports. We took everything we have learned from our service technicians, customers, and race team crew and built the spacer to beat all spacers. We recommend a 15mm front spacer and 10mm rear with this specific combination of wheels, tires, and suspension on this car. Please give us a call if you have any questions. Apex ARC-8 is the classic BBS look which always looks very nice on the E36. Apex offers a wide variety of sizes, colors, and offsets for E36. Essential for any dual purpose track and street car. Save time switching wheels and brake pads with these 12x1.5mm TMS Wheel Studs (75mm length). Perfect for owners who spend a lot of time switching between street and track wheels. Superior strength compared to wheel bolts and they are easily installed. Priced per stud. Coating is a corrosion resistant black. Allen key for fast and easy installation. Long shank for good brake rotor alignment. They re made from heat-treated 190,000 PSI chromoly steel, shot-peened and double magnaflux inspection.